Since I’ve been bored this summer, I came up with the idea of having a Twitter list for making it easy to follow the action from all 13 teams on Saturday (and Monday, Tuesday, Wedensday and Thursday for that matter). It features beat writers that cover the various schools in addition to the school’s athletic accounts. You can subscribe to it at the following link. I’ll get around to adding more basketball accounts once that season gets rolling. I’ll be covering the team again for MAC Report Online this season, while also contributing some pieces for The Athens News. If you are a fan of the almost-world-famous live blog, I can guarantee those will be returning as well. “Bobcat Nation” was fired up when this article proclaiming the Ohio football team as the second most likely mid-major to crash the BCS was released on Yahoo! 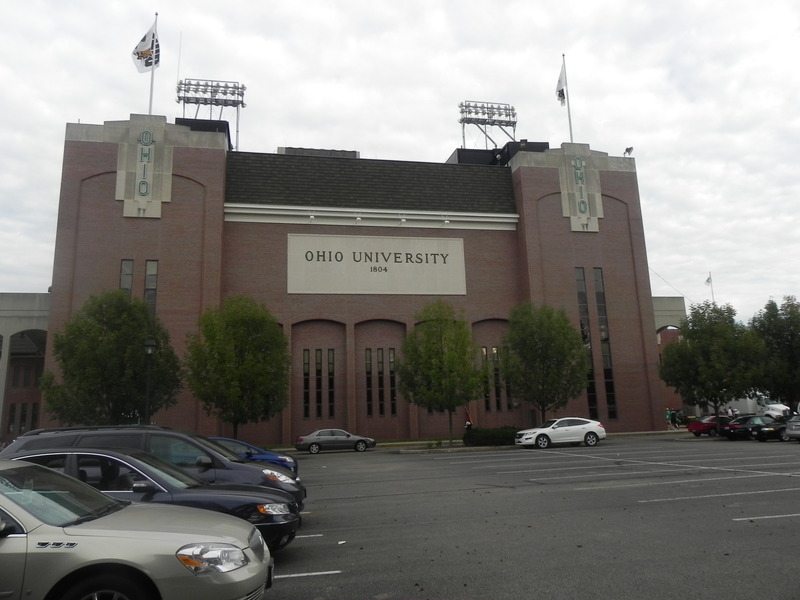 It seems to be an exciting proposition, but Ohio fans shouldn’t get there hopes up. It won’t happen in a million years. Yes, the team has a stellar quarterback in Tyler Tettleton, and returns more starters than any team in the MAC, but there are still many forces that will keep it from happening. Back in spring ball, head coach Frank Solich was constantly disappointed by the play of the wide receiver unit, which is struggling to find their footing after losing Lavon Brazill and Riley Dunlop. There is lots of talent currently with that squad, however they aren’t quite polished yet which should test the offense, especially early in the season. Ohio’s defense is also searching for an answer after losing Noah Keller following the 2011 season. Ohio’s only game against a team from a BCS conference comes during Week 1 against Penn State, which couldn’t come at a worse time. It will be a challenge for the Bobcats to come out strong against a very talented team with so many unknowns as the season begins. Move this game to later in the season, and I’d be much more confident in Ohio’s chance to pull the upset. Even if Ohio finds a way to beat Penn State, the rest of the schedule is so lackluster that a 12-0 season would barely register on the computers. College football guru Phil Steele has Ohio’s schedule for 2012 ranked as the easiest in all of the FCS. Until Ohio beefs up the non-conference portion of their schedule (which is easier said than done) they will never get a shot at the BCS. Ohio football is looking at yet another great team in 2012. They will be the favorites to win the MAC, and another 10-win season including a bowl win is very possible. But when it comes to the chances that Ohio will crash the BCS, Bobcat fans need to keep dreaming. Hello all from Athens. A lot of stuff going on tonight so let’s dive right in. 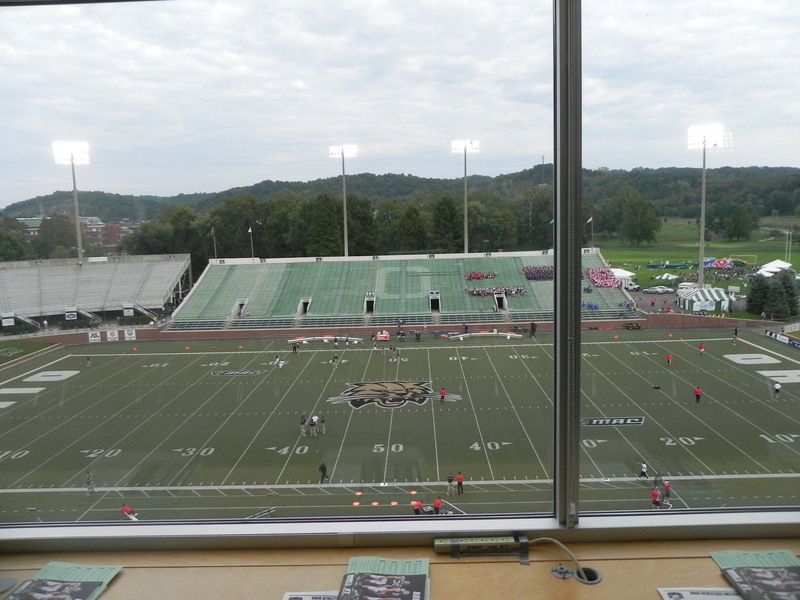 5:44- Going back to their time in the MAC, Marshall and Ohio have been big rivals. Since the Thundering Herd left for Conference-USA the teams haven’t faced off as much. The last two meetings (2009 Little Caesars Bowl and 2010 at Marshall) have been heated affairs with both coming down to the wire. I’d expect the same tonight. 5:56- There was a rumored “surprise” for tonight’s big game. 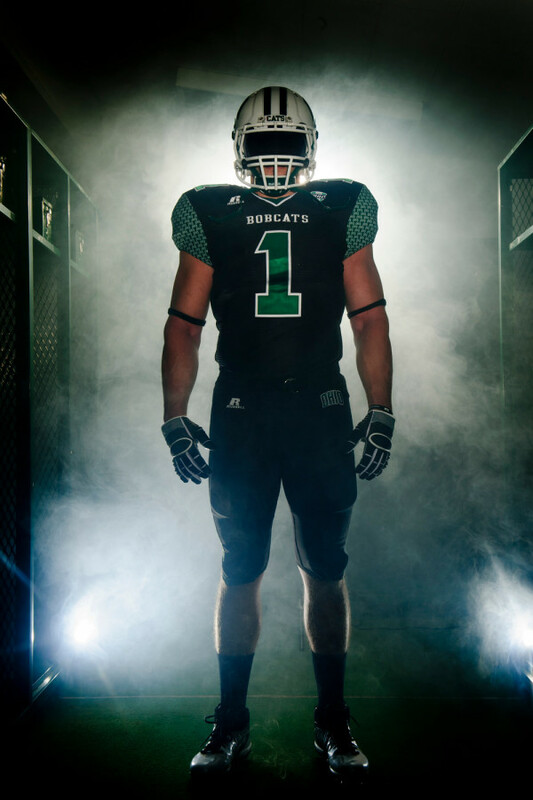 This afternoon it was revealed that Ohio would be wearing special jerseys. They’ve got a nice video package that will run on the video board before the team enters (you can check it out HERE). 5:58- Here’s a better picture of them. They were designed by the equipment staff in the offseason. My favorite feature is the small Ohio logos on the sleeves. Reminds me a lot of Hawaii’s jerseys. 6:15- Just some housekeeping from the game notes. -The teams are playing in what is called the “Battle for the Bell”. The winning team gets to claim a bell trophy. -Ohio holds the all-time series lead at 29-19-6 however they have not beaten the Thundering Herd since 2000. -The Bobcats will be honoring the late Marcellis Williamson with a pre-game ceremony. He died after just completing his senior season last year of a blood clot in his lung. -If you are a student and plan on coming down, I’d suggest that you do so soon. 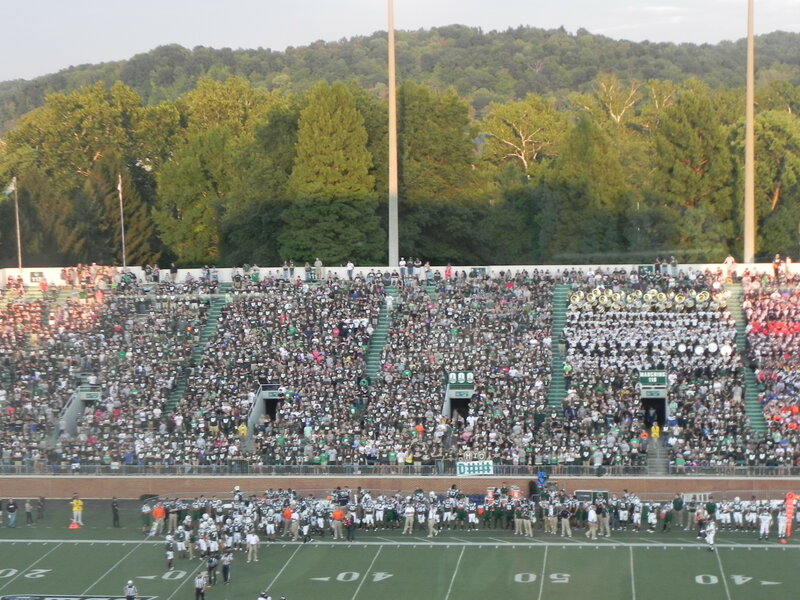 The game is just about sold out of tickets for the paying public and there is already a huge student turnout. 6:21- Should also mention for those who wish to watch, the game will be on ESPN3.com. 6:27- Both teams out on the field for warm ups. 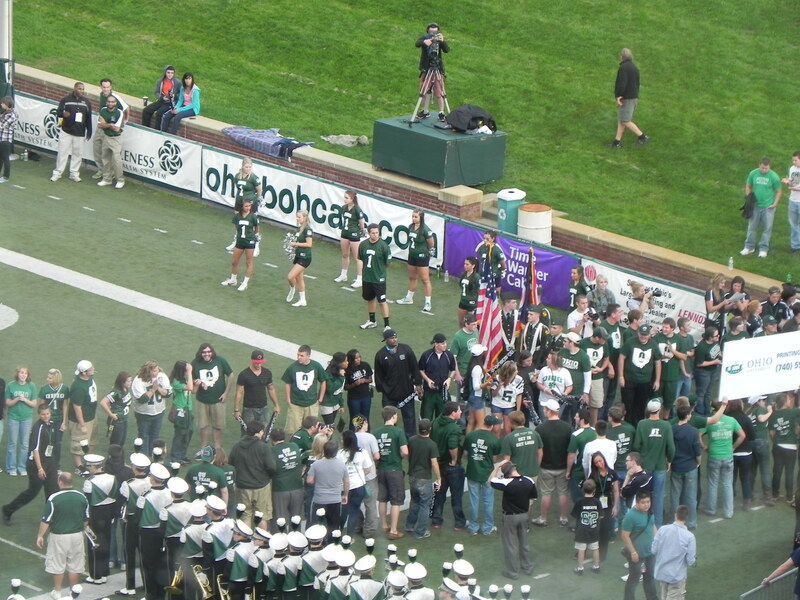 Marshall gets a rousing ovation from their faithful as they took the field. 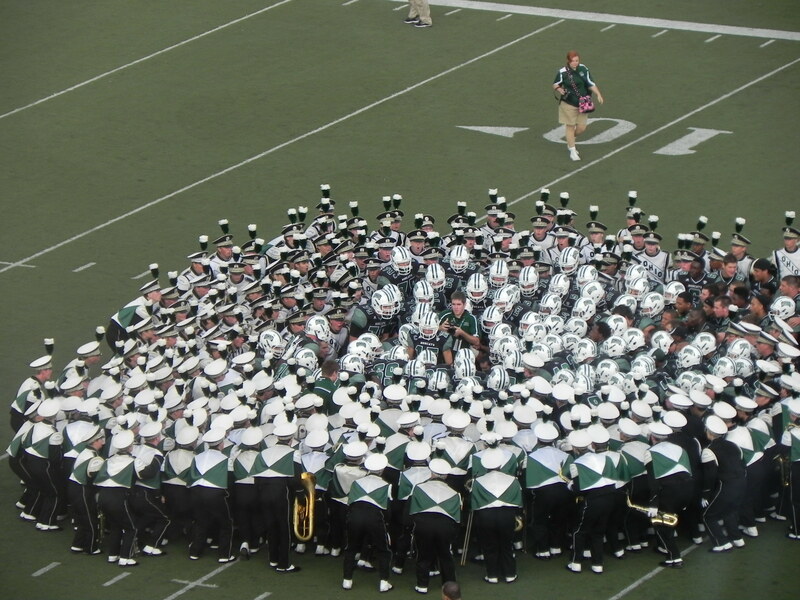 6:32- The Bobcats doing a breakdown with the Marching 110. 6:47- Early arriving students were invited down on the field to make a tunnel for the players. 6:48- Really lively crowd tonight. 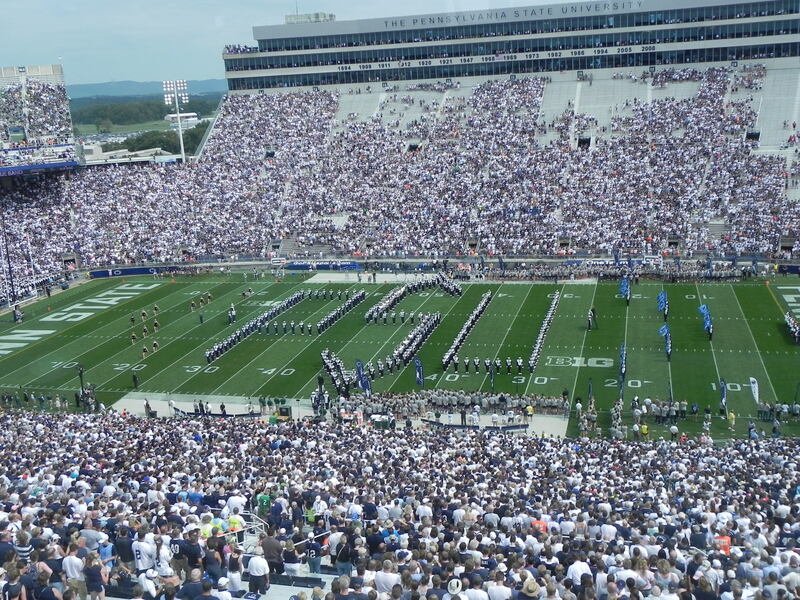 A bunch of recruits were on the field pre-game. Should leave a good impression. 6:54- Packed house, the most exciting band in the land, this is what college football is all about. 7:04- The teams have entered. Ohio wins the toss and has elected to defer. Will be interesting to see how they handle Marshall’s offense. 7:08- That didn’t take long. Omar Leftwich picks off a batted Rakeem Cato pass. Bobcats take over on the Herd 39. 7:12- Bobcats strike first. A Tyler Tettleton scamper set up a one yard TD pass from Tettleton to Lavon Brazill. Brazill made an amazing one-handed catch in the back corner for the score. The offense is clicking right off the bat which is needed. 7:20- Marshall wastes no time in offering a counter punch. Rakeem Cato finds Aaron Dobson and makes a perfect throw for a 45 yard touchdown. 7-7 with 10:28 left in the first. Game on. 7:22- Donte Harden says “GET OFF ME” and breaks numerous tackles while returning the kick all the way to the Herd 19. This game has the feel of an Arena Football matchup. 7:30- Donte Foster pulls in one of the best catches you will ever see (even received a collective “Woaahhhhh” from the media in the press box). Bobcats have to settle for a 20 yard field goal. They lead Marshall 10-7 with 6:43 left in the 1st. 7:43- Scrum. Bobcat interception. Marshall fumble recovery. Another Bobcat interception. All in the span of 3 minutes. Bobcats take over on the Herd 33. 7:46- Donte Harden is a man on a mission tonight. Another impressive run with numerous broken tackles puts the ‘Cats inside the Marshall 10. 7:49- Tettleton scrambles and dives his way into the end zone for a touchdown. Bobcats get some separation and now lead 17-7 with 14:17 remaining in the half. 7:55- After running 23 plays on offense, Ohio is on pace for nearly 100 on the game. The no-huddle is working big time. 7:56-Marshall’s turnover woes continue. Xavier Hughes this time strips the Herd receiver and Nathan Carpenter recovers. 7:59- Whether they run or pass, Marshall can’t stop the no-huddle, Bobcats unleash a 8 play 72 yard drive in 2:40. But once inside the Herd 5, the Bobcats can’t find the end zone. 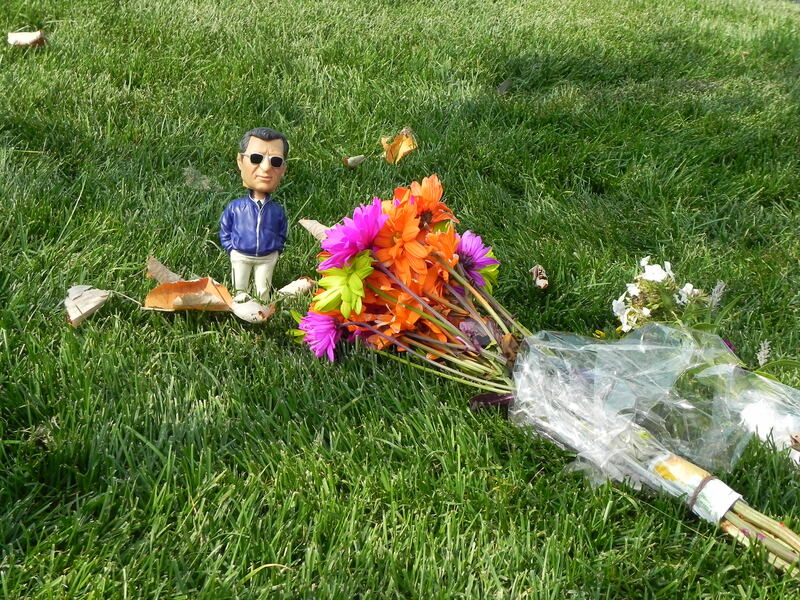 Another short Weller field goal will have to do. 20-7 Ohio with 7:59 remaining. 8:09- With 5:10 remaining in the second quarter, we have our first punt of the game. Incredible. 8:17- Phil Bates catches a swing pass and blows through the Marshall defense for a 50 yard TD. It was unknown what his role would be, but as a receiver he is most dangerous. 8:24- Turnover 5 for Marshall leads to another TD. Same swing pass but this time it’s to Brazill for his second TD of the game. 34-7 Bobcats heading into the locker room with a chance to eclipse 40 points with the first possession of the second. 8:28- Trying to create something late in the half, Ceto sends a bomb downfield that is intercepted by Travis Carrie, his second of the game. I don’t know if Marshall will return after a half like that. 8:43- Tyler Tettleton is going off tonight. 17-22 for 259 yards and 4 TDs (3 passing 1 rushing). He also leads the team with 51 yards rushing. If the team gets a performance like this from him week in and week out, they will be very tough to beat. 8:47- For the second consecutive week, Ohio outscored their opponent 24-0. Good way to show how the team has been able to make early adjustments. 8:49- The Bobcats are on pace for over 700 yards of total offense. 8:53- Ryan Boykin getting carries to start the 2nd half. Has looked strong in his few opportunities to play so far in 2011. 8:59- Yet another well-played drive that stalls in the end. Matt Weller (AKA Mr. Automatic) hits yet another field goal. He is now tied for the all-time lead in Ohio history. 9:06- Marshall has nothing going on offense again and punts. Going to start writing as this one is all but over. Keep it to the twitter (@suhlmann12) for major updates. The Bobcats are opening their 2011 home schedule against the Gardner-Webb Runnin’ Bulldogs. Keep it here as I’ll update the blog pre-game with notes and tidbits and then during the game for thoughts. 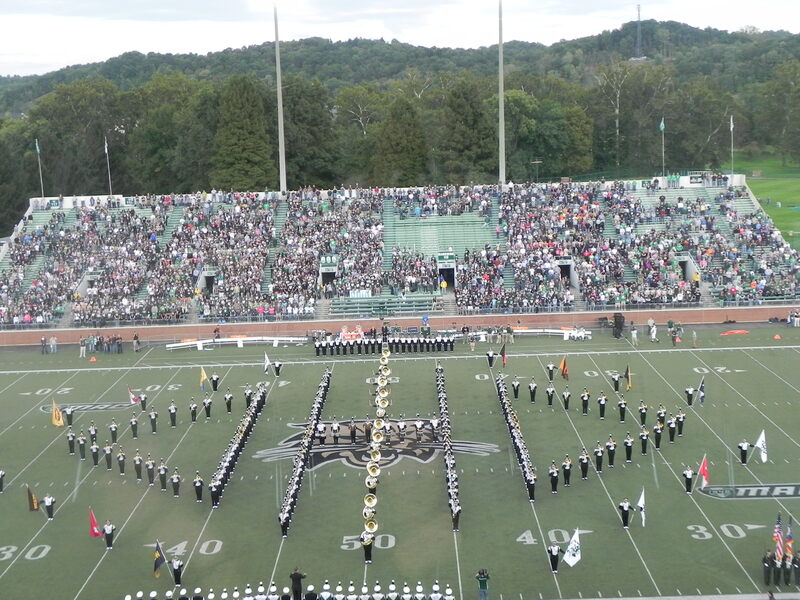 6:04- Props to the Ohio U marketing department making this game both “Band/Cheerleader Night” and “Youth Night”. It will really help out what would otherwise be a lackluster night for attendance. 6:09- Ohio allowed just 6 rushing yards in week 1 which was the third lowest in all of the nation. 6:28- Guess it would be a good time to do some shameless plugs. I will have the recap of this game for MAC Report Online. It’s a great place for recaps of all the action in the conference. The fearless staff of Speakeasy will have coverage of the team on lockdown this year. Be sure to check the site out frequently. 6:31- Don’t know how many teams have their band huddle up with the team at the end of warm ups. It’s quite a sight. 6:37- In honor of fallen defensive lineman Marcellus Williamson, members of the Bobcats defense will take turns wearing his number 62. Tremayne Scott wore it for the first game at New Mexico State. Tonight, it will be Carl Jones’ turn. 6:57- Linebacker Noah Keller is not in pads tonight after he aggravated his hamstring last week. No need to have him risk further injury in a game like this. 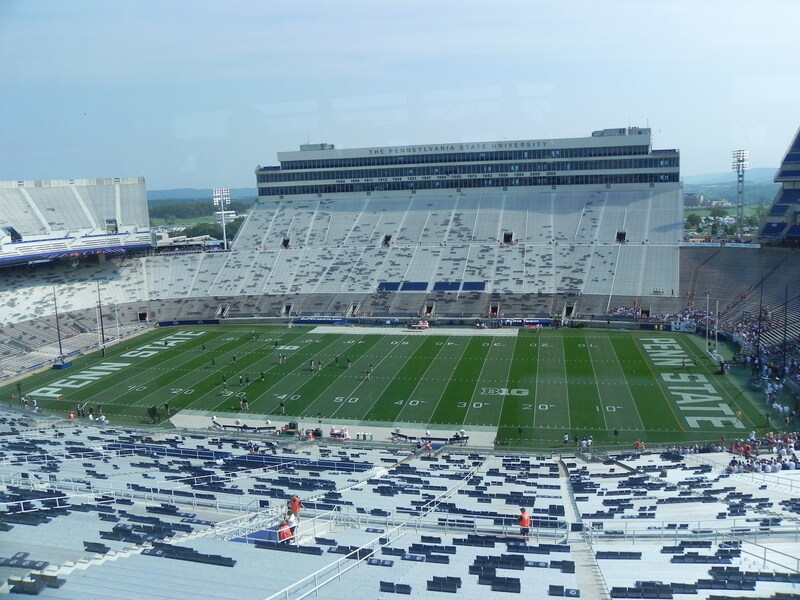 7:03- Awaiting the teams’ arrivals in the stadium. If you care to watch you can do so for free HERE. 7:08- GW gets the ball to start the game. Gain 11 yards rushing on their first two plays. Have doubled the defense’s total allowed on the season. 7:12- After gaining two first downs, the Runnin’ Bulldogs drive stalls. Time for the fans to see the new no-huddle offense for the first time. 7:26- Great crowd for the game tonight. 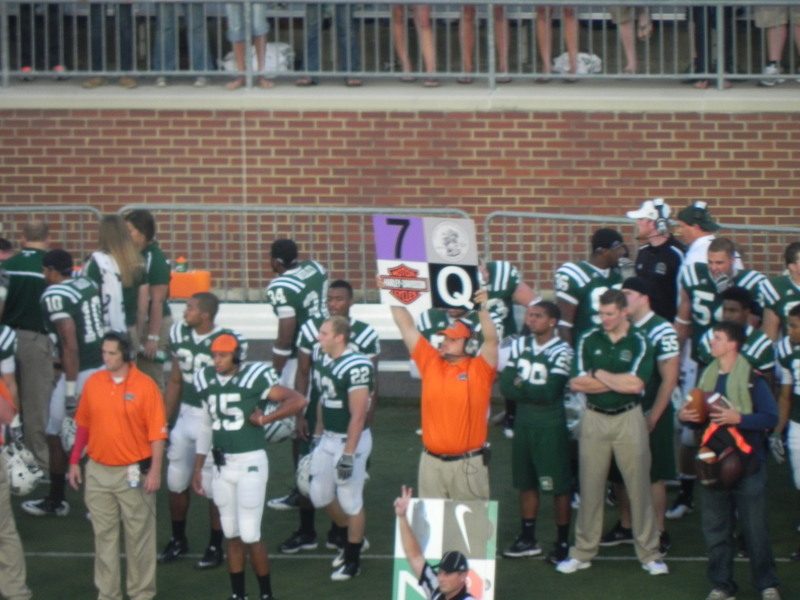 7:26- The Bobcats’ new no-huddle offense uses coaches in bright shirts holding up poster boards with symbols to call the plays. Very similar to Chip Kelly’s system at Oregon. 7:31- Two drives for each teams, and not much going on. A long run by Tyler Tettleton was brought back because of a block in the back penalty. 7:37- Finally a breakthrough. Donte Harden has a 27 yard gain that finally gets the Bobcats into GW territory with 2:30 left in the first. 7:41- Tettleton hits Donte Foster with a 33 yard pass to get the ball down to the five. On the ensuing play, Tettleton gets leveled and fumbles. GW recovers. It’s been that kind of night so far. Pretty bad quarter there by the team as a whole. The defense has been getting stops when needed but they don’t have the tenacity they did last week. Offense is struggling mightily and mental mistakes are killing them. 7:51- The Cats needed a spark and they get one from Nathan Carpenter. He gets his first career interception and returns it 27 yards inside the GW 30. Ohio needs to capitalize on the short field. 7:56- Bobcats take advantage of the short field. Tettleton lays in a beautiful pass to LaVonn Brazil for a 15 yard TD. Bobcats lead 7-0 with 10:57 left in the second. 8:01- Defense responds with a stop. Bobcats could really break it open with another big play on offense. 8:04- Phil Bates makes his first appearance under center tonight. Is a very valuable weapon on the ground in the option attack. 8:09- The drive stalls just inside the GW 30. Matt Weller booms a 45 yard field goal to make it 10-0 with 4:53 remaining in the second quarter. 8:19- The defense gets things going again when Jelani Wosley intercepts a pass and takes it 26 yards to the end zone. Don’t know how many more times they will be able to bail the offense out. 8:23- The pass defense is coming back in a big way tonight. They have only allowed two completions for a total of 15 yards and have forced two picks. 8:25- Yet another interception. This time it’s Gerald Moore. he returns it 30 yards all the way to the GW 40 yard line. 8:31- Bobcats take advantage of the short field. Tettleton finds Dunlop in the very back of the end zone for a 14 yard touchdown. The play was reviewed but stood. Tettleton is getting beat a lot in the backfield but is still making good throws. Ohio was able to break the game open with big plays from the defense. Tettleton has looked really good at quarterback, taking a lot of hits but still making good throws. Stats to come. -Kenny Little of GW is leading all rushers with 79 yards on 18 carries. It’s something the Bobcats will need to correct in the locker room. -Neal Huynh is leading Bobcat defenders with 6 tackles. A couple were big play savers (if that is even a word). 9:00- Bobcats come out with guns blazing. Donte Harden returns the kickoff all the way to the GW 28. The Cats go three and out but Weller makes a 31 yard field goal. 27-0 now. Would have liked to see a touchdown. 9:08 A long kickoff return in rebuttal leads to a 41 yard field goal. An onside kick catches the Bobcats off guard and the Runnin’ Bulldogs take over again. 9:15- This will be about it for updates as I have a deadline to meet. Keep it to my twitter for major updates (@suhlmann12). 9:57- Ohio has this one all but locked up with less than two minutes to play. They will win 30-3. Congratulations to head coach Frank Solich on his 100th career win.